Are there people for whom new experiences are not fraught with anxiety? Hello? Are you out there? Because sometimes I think there are two kinds of people in the world: people who freak out when they do new things, and people who don’t do new things. 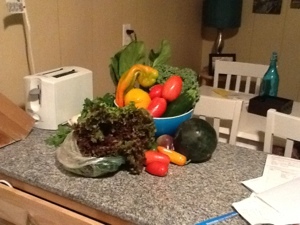 I got my first farmshare box today. For years I pondered how awesome it would be to have fresh, local veggies at my fingertips, but there was always a reason not to. I lived alone. I was single. Then I wasn’t single, but I was running around too much to enjoy summer’s bounty. When I heard that fall farmshares were an option, I decided it was time. I’m home during the week and cooking for two on the weekends. A few weeks ago I registered for the most affordable option that offered the smallest box. Today was my first pickup. And I was terrified. What if I’m not able to use all the vegetables? What if I can’t figure out what to do with bok choy? What if I fail at this? What if I can’t cook, or my boyfriend doesn’t like my cooking, or my creativity finally abandons me and all I can come up with are the same tired dishes and all this parsley goes in the garbage? For a confident woman I can be awfully insecure. Tonight’s menu was peppers with hummus and a green salad. Tomorrow, zucchini soup and parsley pesto, with a likely kale/blueberry smoothie in the morning. Wish me luck. I would love to get one, too! But of course, I have several excuses and I’m anxious about the possibility of being anxious at the sight of all those things I didn’t know how to use. Maybe when I’m a real grown-up.